What can you do about negative thoughts? What do you do when negative thoughts take up space in your mind? It’s not always easy to let them go. They have an ability to bring us down and to bring out the qualities in ourselves we don’t love the most. At Tournesol Kids, we teach that negative thoughts don’t have to remain in your head. 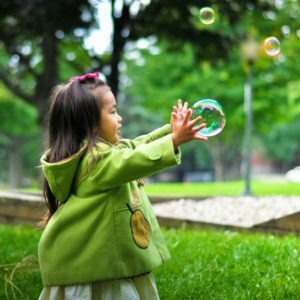 In fact, we have the power to be mindful of our thoughts and then blow them away like bubbles! Imagine a negative thought inside a bubble outside your body and blow it away with an exhale. Try it three times and then check in with yourself and see if your emotions and feelings feel more balanced than before blowing the thought away. Learn more strategies for maintaining a positive mindset through our #PowerUp course.